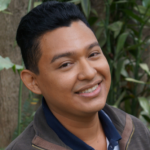 Yosef is originally from San Jose, Escuintla and is 24 years old. In 2014, he began his training in HIV and in 2016 joined the FOGATA movement. Currently, he works with young people from the LGBTI + community in the areas of HIV, human rights, sexual and preventive health. He is part of multi-sectoral networks such as: CODESIDA, DERIVATION NETWORK (MP), MATERNITY NETWORK AND RESPONSIBLE PATERNITY, FOGATA MOVEMENT. Through these partnerships, he is able to work in preventive health and human rights, providing support to various cases of the Differentiated Care Unit (UAD) for HIV and STI cases. He also assists the Public Ministry’s Victim’s Office.